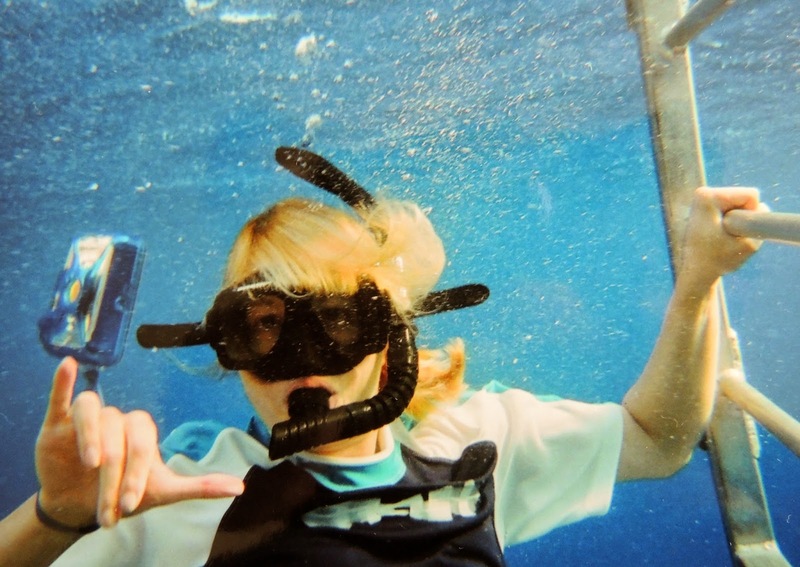 Last year on a girlfriend's trip to Hawaii, one of my friends suggested we book a tour to swim with the sharks. Why would I voluntarily get into the water with something that wants to eat me? I've seen Shark Week. It's safe, she said. You're in a cage the whole time, she reasoned. Come on....be brave. Sigh. She played the "brave" card. I have been working on being brave in the face of things that cause me anxiety. But swimming with SHARKS? That's a whole new level. In the end I decided to do it because I didn't want to be the only one that chickened out. Aren't all the best decisions made this way? As we motored away from the coast, I was feeling good. We arrived at the "shark spot" and the guides started throwing fish guts into the water. Within a few minutes we saw this. At that point I was most definitely not feeling brave. But sitting across from me was a ten year old girl - on her second shark dive that week. Seriously? 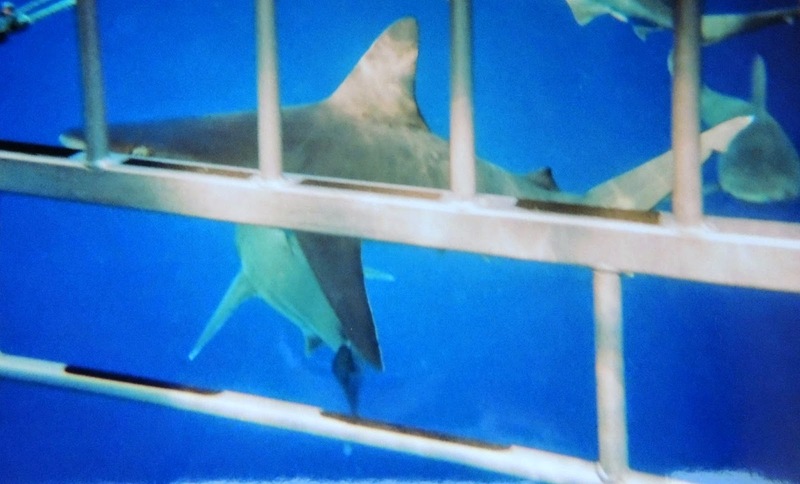 She assured me that I was going to love it, so I took a deep breath and stepped into the shark cage. As they lowered it into the ocean I had a brief moment of panic. Okay, a big moment. 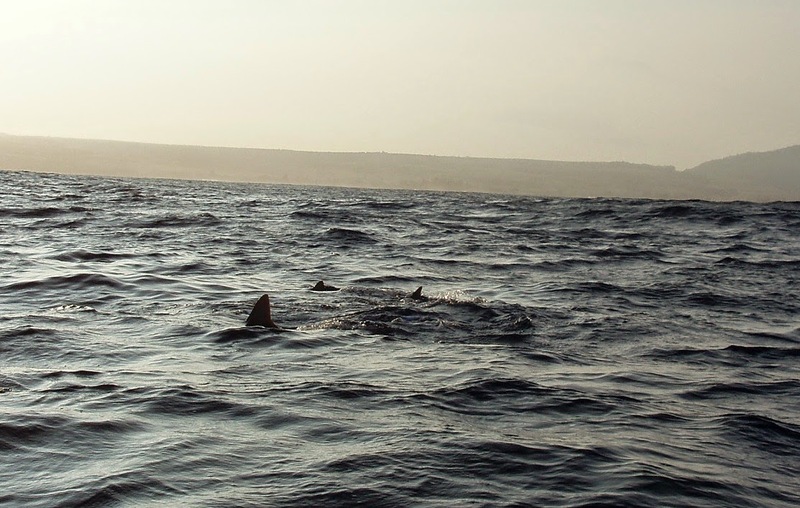 I immediately saw dozens of Galapagos and Grey Reef sharks gliding through the water. I have to admit it was pretty amazing to see them so close up, but also very disconcerting to watch them coming up from below. 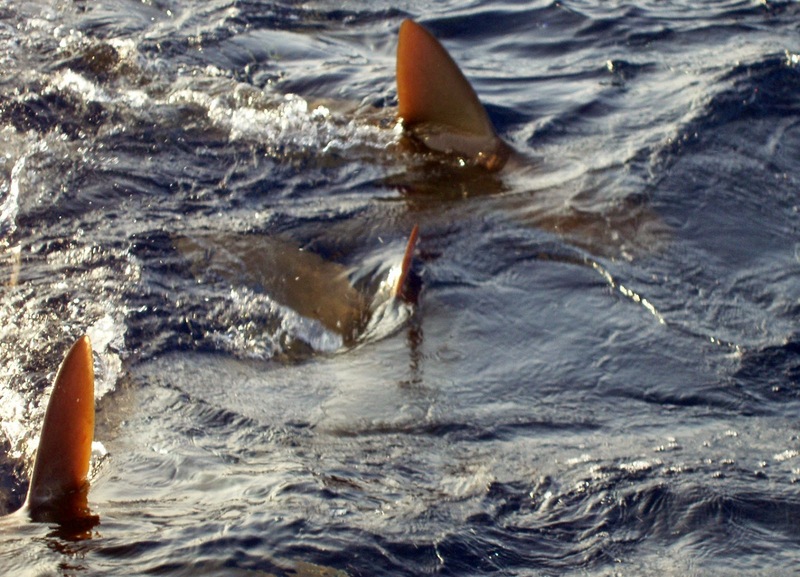 Thankfully, the sharks were completely uninterested in us. Apparently the chum was more delicious and a lot less trouble to eat than humans. I decided not to look any of them in the eye though. Especially this guy. The experience was both terrifying and exhilarating, and I was so proud of myself when it was over. It felt good to be brave and swim with sharks. Would I do it again? Not a chance. You are so brave! It must have been such an amazing experience. 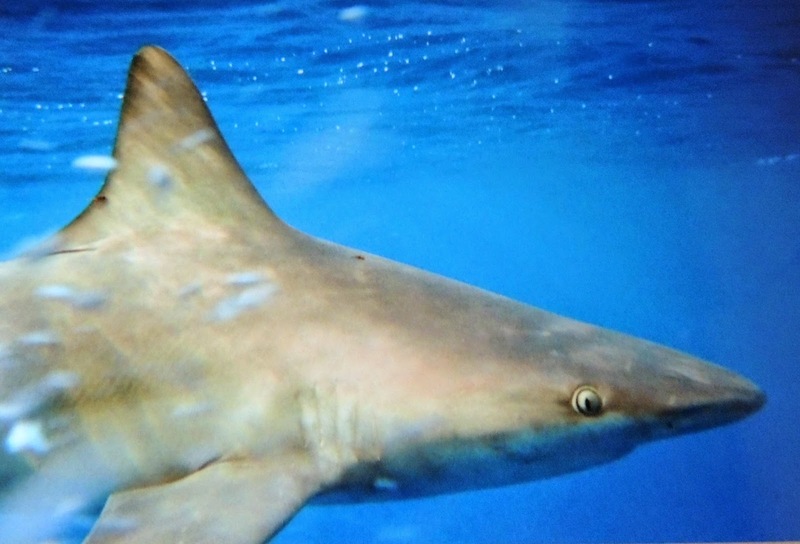 My husband and daughter want to go on a shark dive one day but for me, no thanks! It was pretty amazing once I got down there - but I was more than ready to come back up! Okay this is where we part ways my friend! I will jump out of an airplane but there is now way I am going to purposely offer myself up as a shark buffet! Nope, can't do it! So impressed that you did! Amazing, loved the last line though! I'd try to talk you into doing it with me after our skydive - but I don't want to do it again either! Gaahh! Can one hyperventilate under water? I'm doing it just reading this! You are my new adventure guru! My heart was racing the entire time! What's next Lana? Snakes ? Spiders? You really can do anything after this adventure, I think!! Definitely nothing with snakes. Spiders don't bother me. But snakes...no way! Sounds like your friend challenges you and believes, "If ever there is a tomorrow when we're not together, there is something you must always remember: You are braver than you believe, stronger than you seem, and smarter than you think.". Everyone needs a friend to challege them. oh my god - that is my worst nightmare!! go you!! Thank you for stopping by - it's nice to meet you! What an amazing experience. I'm the same way you are when I conquer my fears, I'm glad to have done it, but I'll check that box and never do that again. Yep, box has been checked on swimming with sharks. Now I hope I never run into one outside of the shark cage! You are a very brave woman!! You are very brave…no WAY could I do this! It was that darn peer pressure :)! I always joke that I'd swim with sharks over getting drunk. I'm not kidding! It scares me less. But they both scare me. Can I just admit that I've never been drunk? Too much alcoholism in my family. You are very brave! There is no way I could do that. Just reading your post made me think of Jaws! I thought about Jaws the whole time! I love the way you end your post saying you were brave and swam with the sharks and then the next sentence is how you wouldn't do it again. I admire you. I'd proudly chicken out and then wear the shirt that said so! I love it! I probably would have chickened out too if it weren't for the ten year old girl who had already gone before! Wow - you ARE brave! I felt the same way after I went parasailing (which doesn't come close to swimming with sharks, but...). I was glad I did it, but wouldn't do it again. I would love to go parasailing - hopefully I'll get to try it one day! Holy Cow!!! Kudos to you, Lana!!! First of all, I don't know how to swim and the water terrifies me. So add to that the sharks...hmm.....I'll probably have a nervous breakdown for sure, haha!! But you're right. Pushing our boundaries often teaches us wonderful things about ourselves. So, congrats!! I was really glad I did it, but never again! I heard about that opportunity when we were in Hawaii, but it didn't fit in with our "budget style" vacation. :) Looks awesome, though--honestly, I would totally do it. If you ever go back, you should definitely do it! So I start reading this and am thinking, "Oh, no she did NOT!" Yep, she DID! She DID! You are officially my HERO! My idea brave is so completely different from yours. Ha ha! But I love how this brave looks on you! Well, thank you so much! Like I said, I'll never do it again, but it was pretty amazing at the time!